I’m in denial that my youngest is in 1st grade! How did that happen? I’m also still not as prepared as I should be, but we’re jumping in anyway, ready or not! I’m partial to computer-based learning for math, especially in the upper grades, but one of the few textbook programs we’ve used and liked over the years for the lower grades is Horizons Math from Alpha Omega Publications. Just in time for the new year, I’ve been given the opportunity to review the Horizons 1st Grade Math Set. I received not only the two consumable student texts, but also the comprehensive teacher’s guide for this level from the publisher. 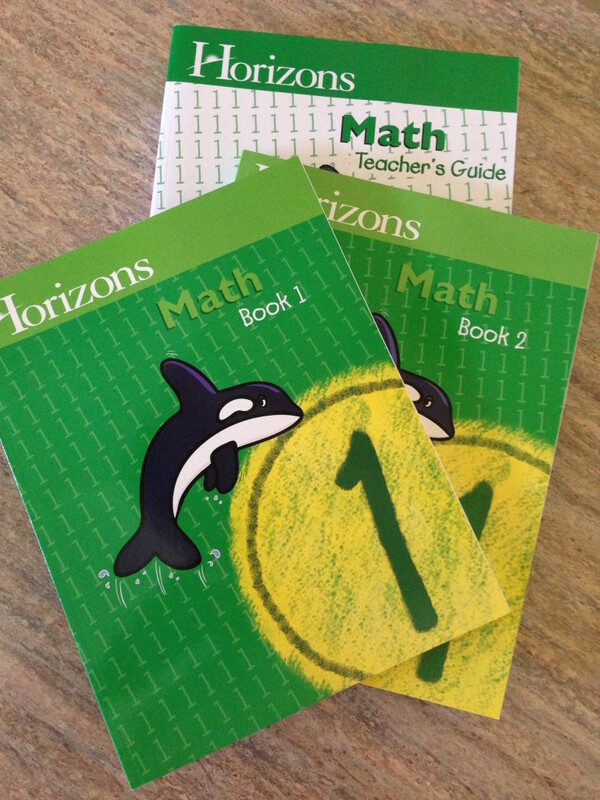 Horizons 1st Grade contains 160 lessons and covers time, fractions, sets, graphs, sequencing, estimation, and more. Horizons uses the “spiral” learning technique,which introduces a concept and then spends several days or weeks on increasingly difficult problems related to that concept before moving on to another one. Later, the concept reemerges in lessons for another concept. This way, students are continually strengthening and reinforcing their skills instead of forgetting them as soon as the unit is over and moving on to the next, unrelated concept. This is my third time through this particular set – we didn’t find Horizons until Kaitlyn (17) was in 2nd grade, but Kyle (14), and Kendall (9) have both been through this one. Kade (6) and I have been working through it for several weeks now. His siblings were tickled to see the familiar green workbooks with the killer whale on the cover, and we even pulled out their completed ones to show him! Just as in the past, I’m really appreciating the straightforward, colorful layout of the lessons. So far, Kade is enjoying them too! The colorful illustrations are appealing and hold his attention, and the variety keeps him from getting bored. One lesson might ask him to write numbers, put an x on a certain object, or do a dot to dot. Another has him filling in blanks and circling and counting objects. During the summer, we’ve only been working about 3 days a week. Some days he’s more than done after one lesson, some days he wants to keep going, and I let him. 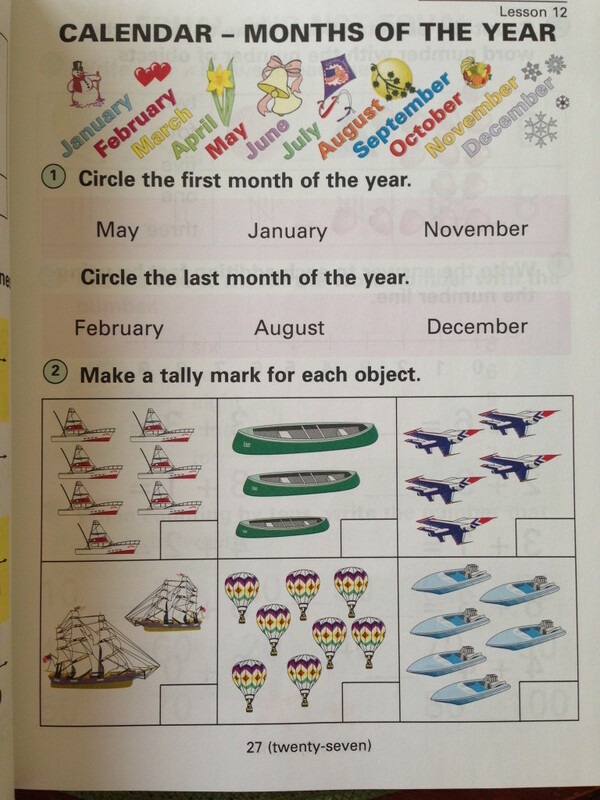 An example of a workbook page. I’ve been finding the teacher’s guide handy. I hadn’t used it for this level before. There are detailed lesson plans, extra worksheets, answer keys for both the workbooks, additional worksheets, and more. The lesson plans are geared for a classroom setting, but I like skimming through the activities for each lesson and sometimes picking one or two just to reinforce the workbook pages. I also like the option of adding an extra worksheet for more practice. The teacher’s guide answer key. After using this program at one point or another with all of my kids, I definitely think Horizons Math is a good, solid choice for elementary math. 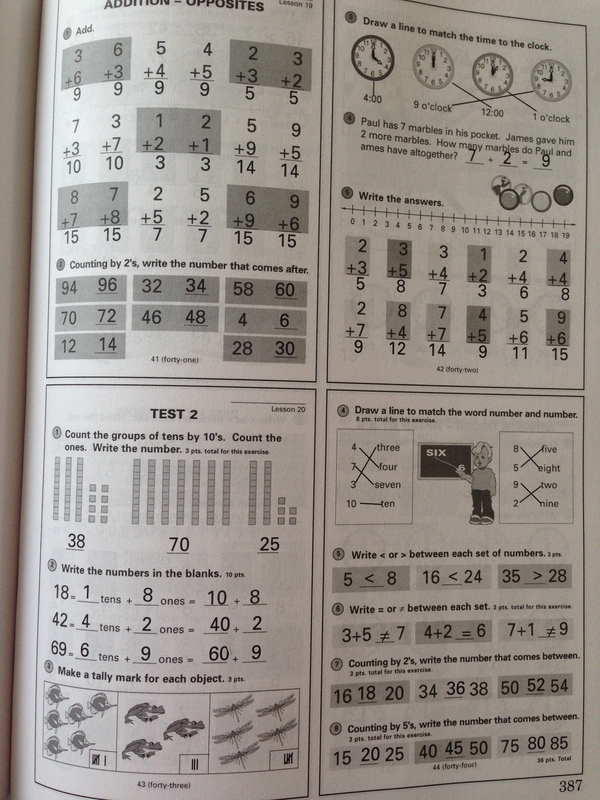 It’s simple to use, the workbooks are appealing, and the lessons have plenty of variety while giving a solid base for more advanced math in later years. I really like the spiral method, where previously learned concepts are integrated into future lessons. I think it’s given my kids a good foundation in math, and the fact that they enjoy doing it is a plus too! Even my non-math loving students don’t complain about these fun, colorful workbooks! Click the link below to read what other homeschool families think about Horizons Math at various levels, plus a variety of other Horizons programs from Alpha Omega.